£85 Off 'Big Three' Lapland Excursion Bundle at Inghams - Limited Time Only! Lakes & Mountains Holidays From £242pp at Inghams - Perfect For Summer! Up to £200 Off Per Couple at Inghams - Spring Sale Now On! Inghams is a specialist package holiday provider, offering its customers tantalising trips across Europe and in Canada. What makes Inghams different from other package holiday companies is that it caters for people with adventurous tastes and lovers of snow sports. Inghams was founded by Walter Ingham in 1934 and the company celebrated its 80th year in 2014. 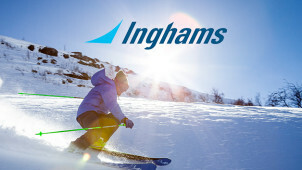 Inghams is one of the UK's leading specialist tour operators. Inghams is part of Swiss travel organisation Hotelplan, part of the Migros organisation, the largest grocery wholesaler and retailer in Switzerland. With so much experience in the leisure and travel industry, it’s no surprise Inghams delivers award winning holidays to its loyal customers. If your favourite sport is skiing, you should check out the Ski Holidays which cater for all ages and abilities. You can even choose an Apres Ski or Singles Ski holiday if the social side is more important than the sport. Inghams holidays aren’t limited to winters sports. During the summer months, you can choose from walking, cycling, rail and lake holidays in gorgeous picturesque mountainous destination all over Europe. How do I use my Inghams discount codes? Browse vouchercloud for the latest deals. Choose your holiday dates, airport and destination. Your discount will be automatically applied to the total. Complete the booking and payment pages. Check the social media channels for competitions and flash sales. How do I arrange special assistance with Inghams travel? If you have a disability or medical condition or any special assistance either for the flight or accommodation then please call the Tailor Made team on: 01483 791 111 before you book. Are meals included in Inghams holidays? Each holiday has a different boarding option, so check these before you book. Some are self-catering, others are half or full board. Can I book extra baggage allowance with Inghams? Yes, but you’ll need to contact the airline you're travelling with, it's not something that Inghams deals with. 10 days before your holiday you will be sent your holiday documents which are titled ‘Your Travel Itinerary & E-Ticket'. This is the documentation you will need to check in for your holiday. Your holiday documents will be sent to you by email. If you need to cancel your holiday, this will only be accepted in writing. Obtain proof of posting or send emails with a ‘read receipt’. A cancellation invoice will be sent to you within seven days. Cancellation charges will be payable up to 10 weeks before departure. Inghams is an adventure holiday company specialising in winter sports, lakes and mountain destination packages in Europe and Canada. You could use Inghams discount codes to make amazing savings on a family ski trip to Austria or France this coming winter. With so many tempting destinations and deals on offer, you’d better go online and start planning your next adventure. Inghams isn’t just about the winter pursuits - the company offers plenty of exciting summertime activities too. If you’re looking for a real bargain holiday, it’s well worth checking out the Late Deals pages, where you’ll find package trips departing this month and next. You’ll be amazed at the European destinations listed, most of which include half-board accommodation and flights departing from a large range of UK airports. If you like nothing more than hiking or cycling in the Alpine fresh countryside against a backdrop of sublime mountains and lakes then you’d better check out the Inghams Lakes and Mountains Holidays. Take the stress out of organising separate components of your itinerary and use your Inghams voucher codes to make great savings on your next European adventure. Inghams get everything sorted for you so all you have to do is pack your suitcase and turn up at the airport.